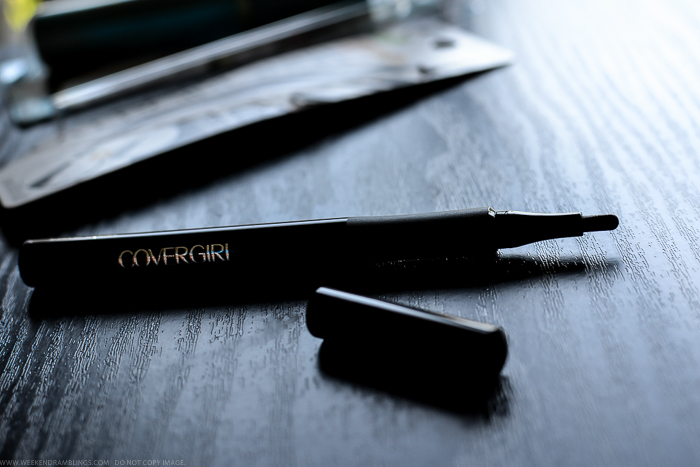 The Covergirl Intensify Me eyeliner is a felt tip liquid eyeliner, and the shade I have is black. 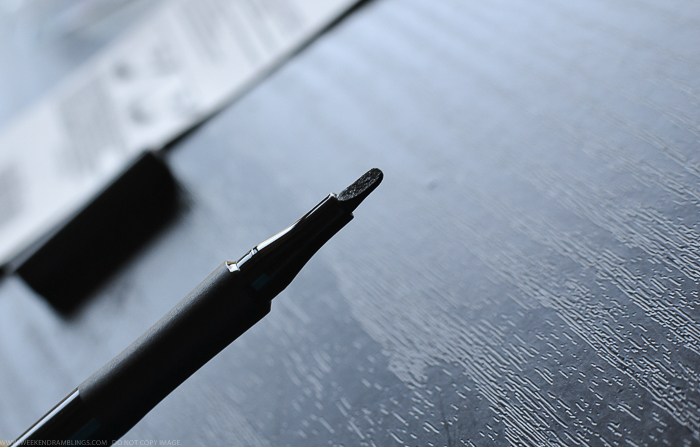 The felt tip has a flattened paddle shape and can be used to draw either thick or thin lines depending on how the tip is turned. 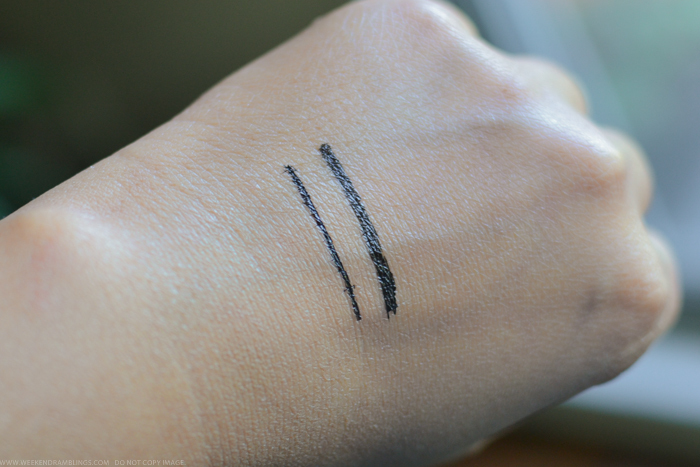 The product itself is a thin liquid formula, and the color is an almost glossy black. The initial glossiness is obviously because the liner is wet, but even after it dries and sets, it doesn't really go matte. Here's a look at the swatches. 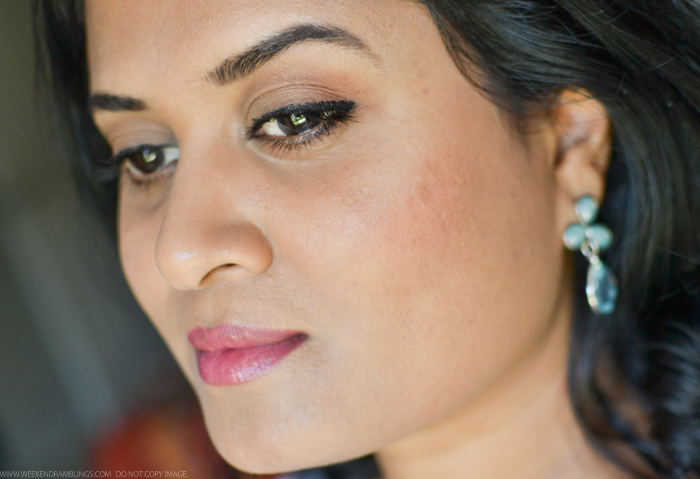 The tip of this eyeliner is designed for ease of application - draw liner thick or thin and/or draw winged liners. I still haven't mastered the art of winged/cat liner, so I really cannot comment on that function, but I can draw a pretty thin line with this tip. Drawing a thick line is easy too, but then it was never really an issue for me - by the time I end up making the lines even, most times I end up with a pretty thick eyeliner anyway :P I don't have smooth eyelids, and I have some pesky eyelashes jutting out of the lashline, and since this felt tip doesn't work around these like flexible brushes do, I got a slightly uneven line. This might not be that obvious in person, but in the photo below I think you can pick up the unevenness to the eyeliner. If you have a steady hand and/or smooth lids, this will not be an issue. 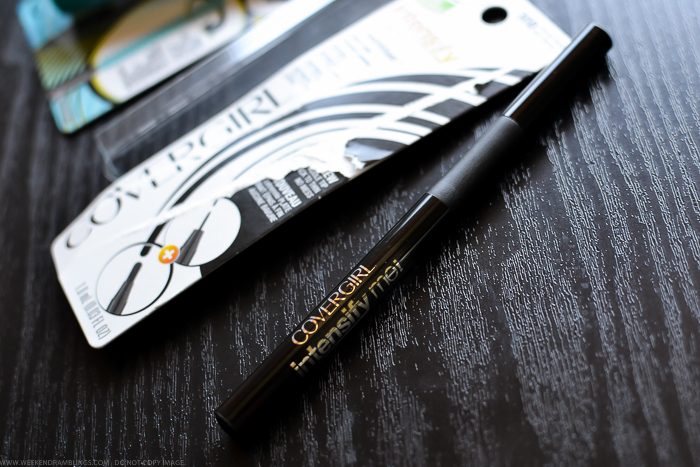 I have mixed feelings on the Covergirl Intensify Me by Lashblast Liquid Eyeliner. I like that it's truly black, and I like the slight glossy sheen it has even when it's dry. I also like how convenient the eyeliner is to use and carry around. What I don't like, though, is how easily the eyeliner comes off with even the slightest hint of moisture. This is not a waterproof product, but my eyes tend to water at the slightest excuse, and I actually rubbed some of this eyeliner off (along the inner corner) before I was done with this makeup. You can see the slight smudge on the corner of the other eye if you stare long enough at the photo. I did wear this a couple of times, though, when I was out doing grocery shopping and other such glamorous activities, and it lasted until I took it off at the end of the day. Overall, a good basic black eyeliner to have and carry around in the bag, but do keep in mind that it rubs off easily if wet. Links provided in the post are for information only and are NOT affiliate/sponsored links. Please do not copy/download images from the blog and repost on your social media channels or blogs. Product in the review was provided by PR.